Zachary Taylor was the 12th President of the United States who served in office from March 4, 1849 to July 9, 1850. What was the life of Zachary Taylor like? The short biography of President Zachary Taylor covers important information and facts about his early life, his family, career and the famous events and achievements of his political life. Our short biography of Zachary Taylor provides an interesting and easy way to learn about the life of the President. The following important facts provide a fast overview of important facts about President Zachary Taylor. Facts and Info: Zachary Taylor was the 12th president of America and the second to die whilst in office. Despite owning many slaves he angered many Southerners by taking a moderate stance on the issue of slavery. For additional info refer to 20 Facts about Zachary Taylor. Facts and Info: He was born on November 24, 1784 in Orange County, Virginia and raised on a plantation. Zachary Taylor was of English ancestry and a distant relative of James Madison, Robert E. Lee and Franklin D. Roosevelt. Taylor was also a descendant of Elder William Brewster who sailed aboard the Mayflower. He died on July 9, 1850 in Washington D.C. whilst in office. Facts and Info: The career of Zachary Taylor included the roles of Soldier, Politician and Statesman. He was educated by a home tutor and was reportedly a poor student. He spent 25 years policing the frontiers against Indians. In the Mexican War he won important victories at Monterrey and Buena Vista. He became the 12th President of America but served for just 31 days until July 9, 1850. Facts and Info: Zachary Taylor married Margaret (Peggy) Mackall Smith. They had 6 children but by the time of his presidency, Taylor's only surviving child was Elizabeth "Betty". His wife, Peggy, chose not to take on the social duties associated with the role of the President's wife, transferring her responsibilities to her daughter, Elizabeth "Betty" Taylor Bliss. Facts and Info: Zachary Taylor belonged to the Whig Political Party. He was 64 years old when he was inaugurated as the 12th president. Millard Fillmore stood as the Vice President. At the time he became President, Zachary Taylor was the most popular man in America, a hero of the Mexican-American War. For additional facts refer to his Presidential Cabinet members. Short Biography of Zachary Taylor: What he was like! 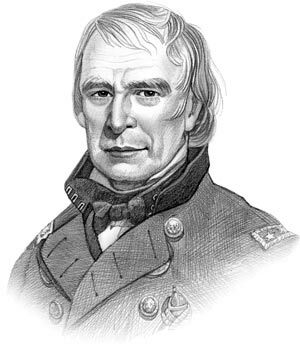 Facts and Info: Zachary Taylor was an average figure standing at 5 feet 8 inches. He was known as "Old Rough and Ready” due to his slovenly dress. Zachary Taylor kept his old warhorse named Whitney on the White House lawn. He was a slave owner but despite this fact wanted to ban the expansion of slavery into the western territories that had been acquired from Mexico. Facts and Info: During his lifetime he played a key role in important events of the era. On January 24th 1848 Gold was discovered at Sutter's Mill in California which heralded the start of the Gold Rush. The Clayton-Bulwer Treaty was signed with Britain in response to attempts to build the Nicaragua Canal that would connect the Pacific and the Atlantic. A Women's rights convention was held at Seneca Falls on July 19th and 20th 1848. Facts and Info: During his life Zachary Taylor suffered from Yellow fever, Malaria, Dysentery and Cholera. This was not unusual for this time period as medical knowledge was in its infancy. What is surprising is that he survived these illnesses and lived to the age of 64. Facts and Info: Zachary Taylor died on 9th July 1850 following a bout of heat stroke after dressing himself in a black high-collar suit for the July 4, 1850 dedication of the Washington Monument. He was buried in Louisville, Kentucky in what is now known as Zachary Taylor National Cemetery. Herbert Hoover gave the eulogy at his funeral. The short biography of Zachary Taylor provides a fast overview of the key facts and events about his life and the accomplishments of his presidential term in office. The following Zachary Taylor video enables you to sit back and listen to the history of his personal and political life - a useful educational resource for kids, children and schools learning about the life of President Zachary Taylor.